Our trip today to Hall 2 was definitely a very interesting one. We managed to spend some time with one of DFI's motherboard engineers - Mr. Jarry Chang. Jarry was the person who designed ABIT IC7 before he left for DFI. 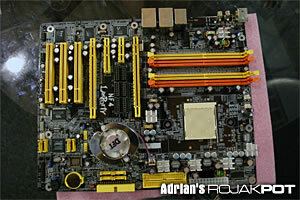 His latest work at DFI is the new AMD 939-based Crossfire motherboard. As many of you already know, Crossfire is ATI’s answer to NVIDIA’s SLI. During our visit to the DFI booth, we managed to get a preview of DFI's Crossfire solution. The motherboard itself is not ready for mass production yet as there are still a few things to work out. Fine-tuning of the board was not possible yet as everything was pretty much still in the beta stage. Therefore, the stability of this board isn’t up to the level one can use it 24/7. But from what we saw, it is still a respectable sample, considering the fact that the DFI only had about two months to get the board out in time for Computex. 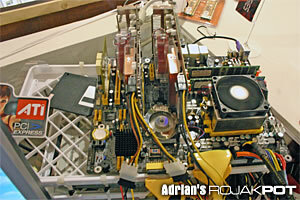 The board scored around 9,945 3DMarks with two ATI Radeont 850XT cards. 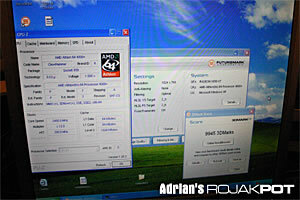 The testbed used the AMD Athlon 64 4000+ processor and memory timings of 2-2-2-6.